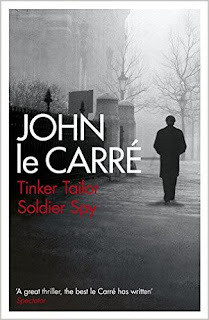 I'm a big fan of the relatively new film version of Tinker Tailor Soldier Spy. It's a great spy movie and for a while I've been looking for an excuse to read the book. The movie is, in its way, chaotic and difficult to pin down in one go. For example, it jumps back and forward in time, mostly without warning, and relies on the wit of the viewer to put together the pieces. A friend of mine said that the best way to know what is going on is to pay attention to the main character's glasses. Apparently they're different in flashbacks. The movie is as much a post-modern study of film-making as it is a spy thriller. I did not expect the novel to be so similar. 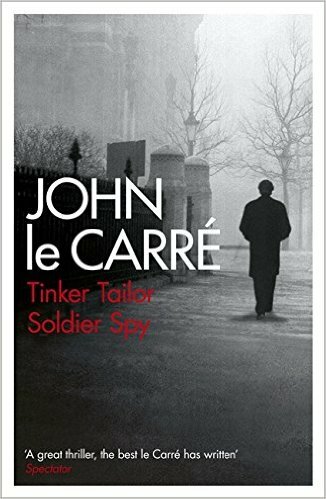 John le Carre's style is very much understated and there are passages that remind me more of Charles Dickens than Ian Flemming. If you've just read a Dan Brown, you'll likely find it frustratingly slow and uneventful. That doesn't mean that Tinker Tailor compares unfavorably to today's fiction, quite the contrary. It doesn't try to wrap everything up in a sentimental finale, where the heroes prevail and love triumphs. Those tricks are reserved for Ken Follett and the likes. But I have to say that I still enjoyed the film more. Not because the novel is inferior, but because the actors are wonderful and the script is just the right combination of not saying enough and implying too much. In a way, it is almost a breakout feature for many of the cast involved. Benedict Cumberbatch was on the up and up but not yet successful, Tom Hardy was perfectly cast as Ricki Tarr. Even the eponymous Tinkers and Tailors were cast so well that even though they remain background characters, you can feel the back story there. A big thank you to le Carre for writing it and Tomas Alfredson for directing it.